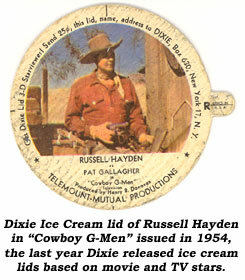 Do You Remember... "Cowboy G-Men"
Like “Kit Carson”, “Range Rider”, “Gene Autry”, “Steve Donovan”, “Wild Bill Hickok” and others, “Cowboy G-Men” were action packed half hour mini-B-westerns starring former Hopalong Cassidy juvenile sidekick Russell Hayden as Pat Gallagher and his sidekick, former child star, Jackie Coogan as Stoney Crockett. Hayden’s horse was Zipper. Originally syndicated from Sept. ‘52-June ‘53, and often sponsored by Purity Bakeries (Taystee Bread), its 39 episodes were shot in color, but only one (“Salted Mines”) remains for viewing in color today, although the other 38 exist for collectors in b/w. Ratings wise, the show was a huge success, bringing in over 50% audience share in some markets (unheard of today) according to tradepaper BILLBOARD. Lensed at familiar B-western locations (Jack Ingram’s Ranch, Iverson’s and the unknown Silvernale’s Ranch) and being populated by many former B-western regulars tied the series even closer to its Saturday matinee roots. Opposing law and order just as they’d always done were Lane Bradford, Rick Vallin, Marshall Reed, Roy Barcroft, John Cason, Kenneth McDonald, Riley Hill, Harry Lauter, Gregg Barton, Lee Roberts, Myron Healey, Pierce Lyden, Tris Coffin and other B-western stalwarts. Producer Henry B. Donovan had been property master on Hopalong Cassidy movies before creating “Cowboy G-Men” for his own Telemount Mutual production company. Donovan not only remembered Hayden from Pop Sherman days but also recruited actors such as Morris Ankrum, Tom London, Sam Flint, Stanley Andrews and Jean Parker as well as some behind the camera personnel such as director Lesley Selander, who began as a cinematographer in silents and knew his way around a horse, directing westerns with Hoppy (28 titles), Richard Dix, Buck Jones, Tim Holt, Bill Elliott, Allan Lane, Gene Autry and Rod Cameron. “Cowboy G-Men” was Selander’s first adventure onto the tube. 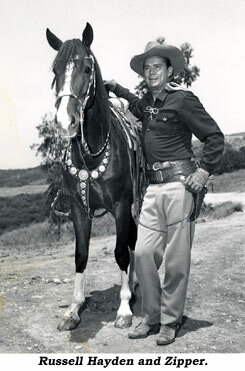 Other episodes were directed by Lewis Collins, who guided rangeland epics (and 14 serials) for nearly 25 years with everyone from Reb Russell and Jack Hoxie to Whip Wilson, Jim Bannon and Wayne Morris; Donald McDougall, who soon helmed Roy Rogers TVers and later “Bonanza”, “Rawhide”, “Virginian” etc. ; TV comedy director George M. Cahan (how’d he get in here? 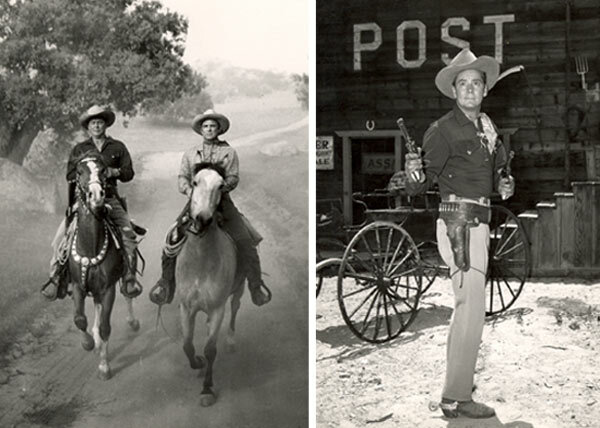 ); Harold Daniels, who began as an actor in Bob Steele and Hoppy westerns and switched to directing low budgeters in ‘48 (“Daughter of the West”, “Port Sinister” and the Easter perennial “Prince of Peace”); former script supervisor Leslie H. Martinson who went on to direct Roy Rogers TVers and scores of WB TV westerns; film editor since ‘31, Paul Landres, who switched to directing at Lippert with “Grand Canyon” and “Square Dance Jubilee” and later called the shots on over 375 TV episodes including “Kit Carson”, “Bonanza”, “Cheyenne”, “Rifleman”, “Maverick” and “Wyatt Earp”; and former film editor Reg T. Browne, who later worked for Hayden’s “Judge Roy Bean” and “26 Men”. 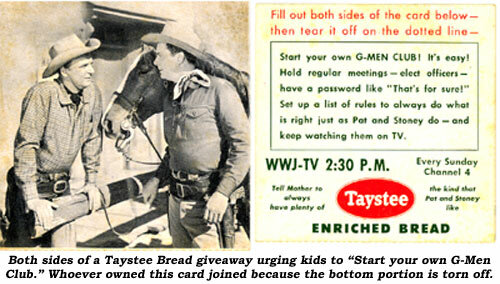 Sadly, he helmed the bulk of the “Cowboy G-Men” shows. He might have been a competent cutter, but as a director he was inept. 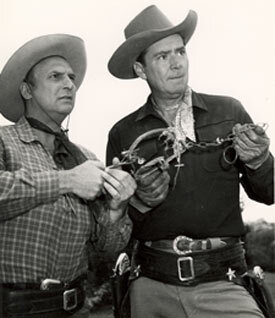 The majority of the scripts were written by Buckley Angell, who also worked later for Hayden on “26 Men” and “Judge Roy Bean”, wrote some “Cisco Kid”s and went on to script several “Rawhide” episodes; prolific Orville H. Hampton, who began as a contract writer for Lippert (“I Shot Jesse James”, “Train to Tombstone”) and former pulp fiction writer William R. Cox, who moved to TV and film (“Veils of Bagdad”) in ‘53. Regular cameramen included Harold Stine, who much later was cinematographer on “The Poseidon Adventure”; William Whitley, who worked on Jungle Jim and Tarzan films as well as “Gunsmoke in Tucson”, “Quantrill’s Raiders” and various TVers; and Kenneth Peach who dated back to ‘33 as photographer on Laurel and Hardy’s “Sons of the Desert”. He toiled on into the ‘70s, including “Lone Ranger and the Lost City of Gold”. 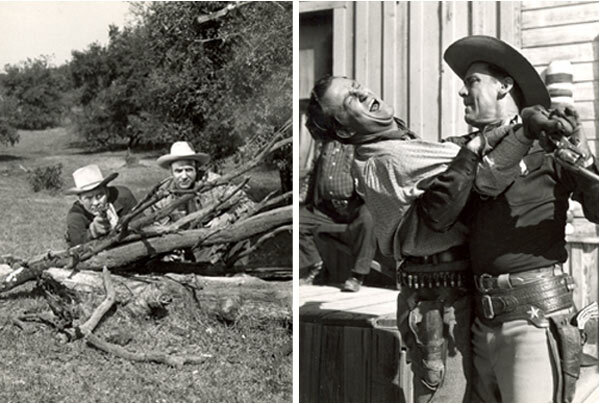 It’s noted Ira Webb, brother of low budget ‘30s producer/director Harry S. Webb, was often assistant director or production manager on “Cowboy G-Men”. He’d served in the same capacity during his brother’s Reliable and Metropolitan days, even directing two of Bob Steele’s worst—“El Diablo Rides” and “Wild Horse Valley”. Webb eventually became an assistant director on Lash LaRue’s PRC series and, when Ron Ormond and his Western Adventure Prod. took over, Webb became an associate producer and often co-writer on the LaRue titles. 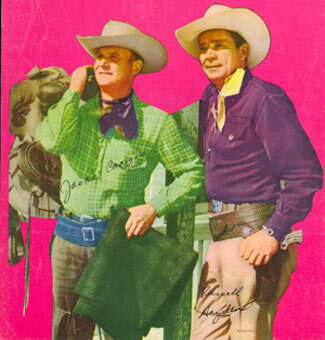 The big detriment to “Cowboy G-Men” was the painfully unfunny Phil Arnold as Zerbo, another Cassidy tie-in as the name was derived from Earle Hodgins’ snake oil salesman in “Santa Fe Marshal” (“Zerbo! The greatest combination of roots, herbs, barks and vigors that has ever been known to mankind…”) Whoever’s idea (Donovan’s?) that Zerbo’s outlandish antics and disguises were humorous was sadly in error. Toward the end of the series, Russell Hayden began his move to the other side of the camera. He was never totally happy being an actor from the time he (real name Pate Lucid) was recruited from a film cutter and production manager by producer Harry Sherman to play Hoppy’s partner, Lucky Jenkins. 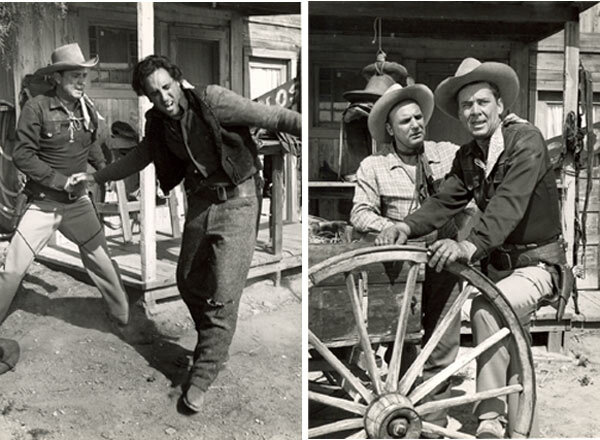 From nearly the beginning of “Cowboy G-Men”, Hayden was listed as associate producer, but took a more active role when new producer/director Thor Brooks, elevated from supervising editor, took over the last six episodes. 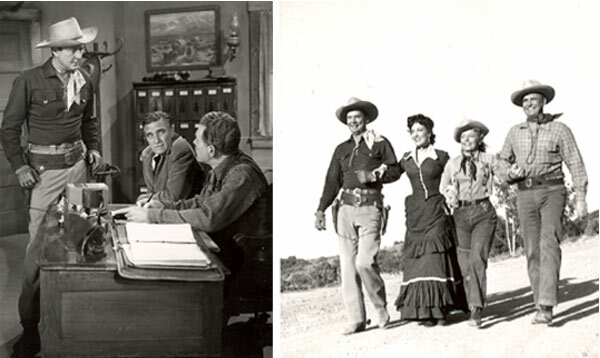 Hayden went on to produce “26 Men” and “Judge Roy Bean”, projects he was most proud of in his long career. Hayden died in ‘81 at 70. 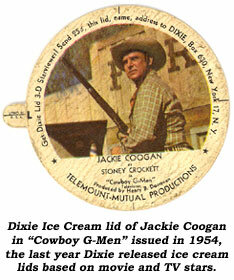 Coogan died in ‘84 at 69.